Players of the Week vs. Collierville: Ryan Flack, Special Teams; Tate Kolwyck, Offense and First Citizens National Bank Player of the Game; Ben Evans, Defense. Staff Photo. 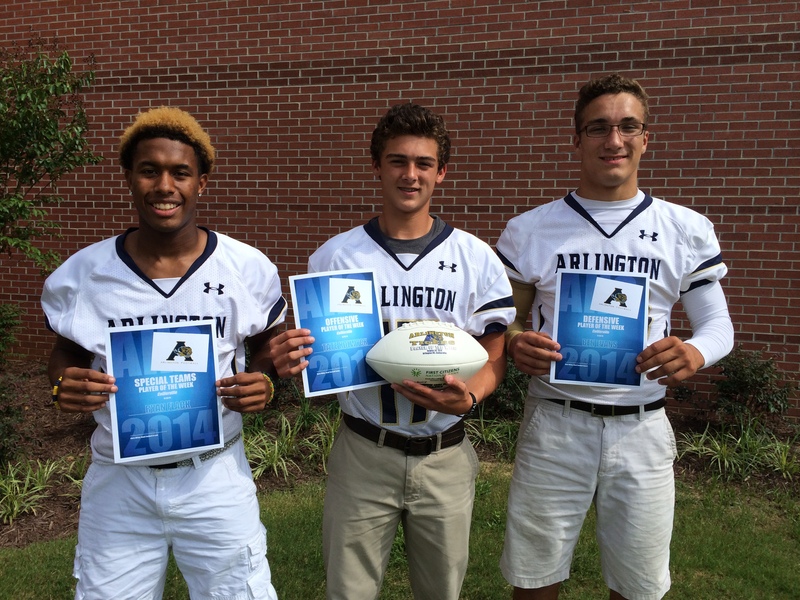 The Arlington High School Tigers Players of the Week for the August 29 game against Collierville were recognized today at a team meeting before tonight’s trip to take on the undefeated Bartlett Panthers in the first district match up of the season. The Special Teams Player of the Week, Senior defensive back Ryan Flack (#34) was named for his performance on the Tigers’ kickoff team. Flack had one solo tackle, one assist, and Tigers Head Coach Chris Wiley added, “several key special teams plays.” Freshman quarterback Tate Kolwyck (# 17) received offensive player of the week and First Citizens National Bank Player of the Week honors for throwing three touchdowns and going 22/30 for 227 yards with one interception. Senior defensive end Ben Evans (#43), the defensive player of the week, tallied up seven tackles, one sack, and forced a fumble against the CHS Dragons. Players of the week: Cameron Durley, Special Teams; Jonathon Mabone, Defense and First Citizens National Bank Player of the Game; Keelon Webber, Offensive. Coach Wiley. Staff photo. 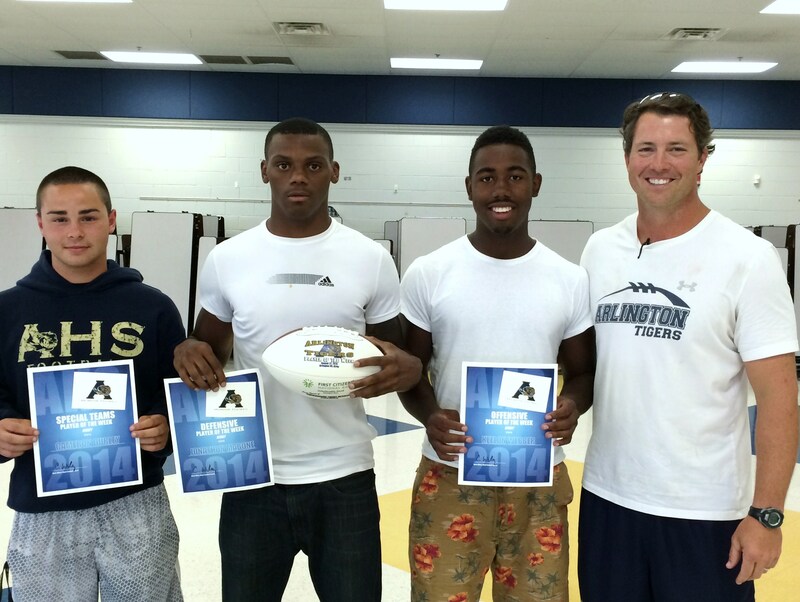 Arlington Tigers Players of the week for the August 22 game against Kirby High School were recognized at a team meeting before tonight’s matchup with the Collierville Dragons. The defensive player of the week, senior linebacker Jonathon Mabone (#6) had 16 tackles and one sack last week. Mabone was also named the First Citizens National Bank Player of the Game. Junior running back Keelon Webber (#10), scored all three touchdowns in last Friday’s victory over Kirby; senior kicker Cameron Durley (#22) scored a field goal in the second half and was named special teams player of the week.